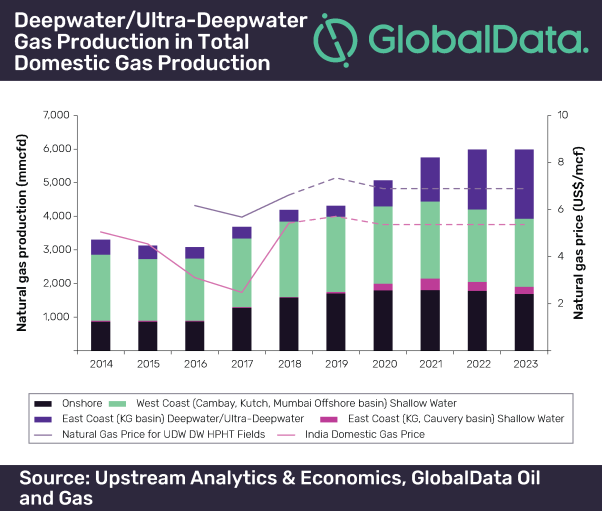 At a time when production at traditional offshore assets on the west coast is set to decline over the next decade, the upcoming deepwater and ultra-deepwater projects in the Krishna-Godavari (KG) basin at the Bay of Bengal will play a crucial role in India's move towards a natural gas-based economy, says GlobalData, a leading data and analytics company. The company forecasts India's domestic natural gas production to grow by 67% to approximately 6,000 million cubic feet per day (mmcfd) in 2023, of which the upcoming deepwater and ultra-deepwater projects in the KG basin will account for 2,000 mmcfd. The price ceiling for these projects has been raised from US$6.17 per thousand cubic feet (mcf) in 2016 when it was introduced to US$6.62 per mcf in 2018, allowing companies to make stronger investment cases for these complex developments. Gas price for other fields rose from US$3.11 per mcf to US$5.43 per mcf during the same period. The commerciality of India's deepwater and ultra-deepwater developments has been positively affected by the continuing low costs in the service sector. Cheaper drilling contracts, subsea production systems, and associated facilities saw field development costs reduced by at least 20% compared to the initial estimation. These cost reductions are not only opening up new exploration and development opportunities in a relatively underdeveloped region, but are also very important toward creating value from the projects.